The purpose of example application below is to demonstrate UDP communication between ESP8266 and an external client. 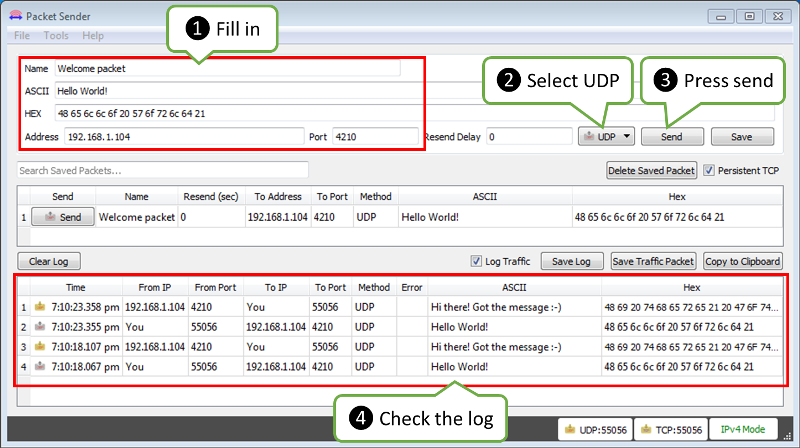 The application (performing the role of a server) is checking inside the loop() for an UDP packet to arrive. When a valid packet is received, an acknowledge packet is sent back to the client to the same port it has been sent out. The first library ESP8266WiFi.h is required by default if we are using ESP8266’s Wi-Fi. The second one WiFiUdp.h is needed specifically for programming of UDP routines. Once we have libraries in place we need to create a WiFiUDP object. Then we should specify a port to listen to incoming packets. There are conventions on usage of port numbers, for information please refer to the List of TCP and UDP port numbers. Finally we need to set up a buffer for incoming packets and define a reply message. At the beginning of setup() let’s implement typical code to connect to an access point. This has been discussed in Quick Start. Please refer to it if required. Once connection is established, you can start listening to incoming packets. That is all required preparation. We can move to the loop() that will be handling actual UDP communication. Once a packet is received, the code will printing out the IP address and port of the sender as well as the length of received packet. If the packet is not empty, its contents will be printed out as well. Please note we are sending reply to the IP and port of the sender by using Udp.remoteIP() and Udp.remotePort(). Now we need another application to send some packets to IP and port shown by ESP above. Instead of programming another ESP, let’s make it easier and use a purpose build application. I have selected the Packet Sender. It is available for popular operating systems. Download, install and execute it. UDP packet contents: Hello World! The text 192.168.1.106, port 55056 identifies a PC where the packet is send from. You will likely see different values. As ESP sends an acknowledge packet back, you should see it in the log in the bottom part of the Packet Sender’s window. For review of functions provided to send and receive UDP packets, please refer to the UDP Class documentation.